We usually don't recomend you to reduce your weight quickly eccept special reason. In the beginning, people often learn workout from YouTube, books and so on. People train by themselves, but most stop before the body shape changes. If you are taking time from your busy day to workout, but you aren't seeing any results, then it's just a waste of time. We give you counseling on the first day to clearly set a goal. We then continue to give advice for what to eat, what to avoid eating, and when to eat to reach your goals. 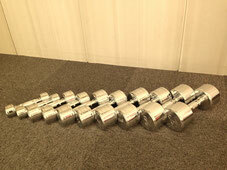 We use a variety of free weights, including barbells, dunbbells, weighted balls, etc. We never force a weight that is too heavy, nor give you more reps than is necessary. We give beginners a lesson, slowly building on correct form and proper positioning while using the weights. We then increase the weight and reps little. taking into account your ideal body shape. Some women believe that working out with weights builds big muscles. This is not true for women because of lack or testosterone and protein. The weight training method depends on your ideal body shape. You can lose weight by diet alone, but only calorie control and cardio are not the best ways. When you adhere to a proper diet, of course you can lose weight, but the resulting shape is not always nice. After returning to the previous diet, it is easy to rebound to the previous shape. Because too long cardio and low calorie diet are losing calories as well as muscle. The best way to boost our metabolism is to increase our muscle. If our muscle is increased, that means our resting metabolism is also increased. That means if we eat regular food, we won't get fat so easily. Insulin is very important hormone for getting in shape. When we eat food, insulin is automatically increased. If you don't workout, insulin preferentially works on your fat but, if you do workout and have enough muscle, it preferentially works on muscle. Our beautiful body line is decided by muscle. Increasing muscle is very important but, diet is the most important thing to see the muscle under the fat. We give you advice for what to eat, what to avoid eating, and when to eat to reach your goals while giving lesson or sending e-mails. For the first 3 times, once a week is enough. We will mainly focus on the basic proper forms of working out and lifting weights. Then after 3 or 4 times, and if it's possible, start working out 2 times a week. If your schedule is tight, of course once a week is ok but, I recommend you come twice a week to reach your goal more quickly. We usually don't recommend you to reduce wight quickly such as "100 days diet" picture, or other fad diets. When we reduce fat quickly, we are also losing muscle. So when we stop it, we will often rebound easily but, sometimes we have to try it for occasions such as weddings, going to the beach, meeting old friends and so on. You should start preparations at least 3 months before. I recommend you to work out more than two times a week and you need to change your diet. In this case, diet nutrition is the most important.